Could low vitamin D increase your diabetes risk? It’s that time of year when the sun is shining more during the day and people are outdoors more often. This fresh air and sunshine is not just good for your well being, but a study has also shown that without enough of the sunshine vitamin, vitamin D, you may increase your risk of type 2 diabetes. Vitamin D is a fat-soluble vitamin that is best know for its role in keeping bones healthy. This vitamin helps improve calcium absorption in the gut, which helps with bone growth and bone remodeling. Without vitamin D, you may be at risk for weak bones, and in turn increase your risk of fractures. Fortified dairy products, orange juice, or cereal. Eggs (vitamin D is in the yolk). Fatty fish like salmon, tuna fish, swordfish, and cod liver oil. You can also get your recommended vitamin D intake from getting about 5 to 30 minutes of sun exposure in the day time between 10 AM and 3 PM. You should do this at least twice a week to the face, arms, legs, or back without sunscreen. Those at risk for low vitamin D include those who do not go outdoors often such as the elderly, immobile, or disabled. Breastfed infants, those with fat or vitamin absorption issues, and those with dark skin are also at risk for low vitamin D. Although sunlight exposure can be absorbed in cloudy weather, people living in these climates may be at greater risk for low vitamin D than those who live in sunny regions since they may not be outdoors as often due to the weather. A normal vitamin D level is around 50 nmol/L. If you are vitamin D-deficient, then your healthcare provider may give you a vitamin D supplement to take daily. The vitamin D lab may not be a standard lab taken at your physical, so you may have to ask your doctor to perform this lab separately. 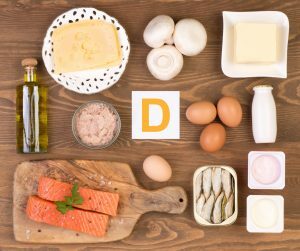 A study of people with diabetes and pre diabetes looked at the link between vitamin D and diabetes risk. Study results show that as vitamin D levels increased, the lower the risk of diabetes. In fact, those people with a vitamin D level less than or equal to 30 nmol/L were about three times more likely to have diabetes than those with a level higher than 30nmol/L. Those people with a vitamin D level greater than 50nmol/L had the lowest risk of getting diabetes. Lose weight if you are overweight or obese. Even a 5-10-percent weight loss can help lower your diabetes risk. Eat fewer calories each day. This does not mean starve or deprive yourself, since this will wreak havoc on your metabolism over time. Just control your portions each day by following the guidelines on the MyPlate website. You can ask a registered dietitian or your healthcare provider for more information on how many calories you should be eating each day for optimal health. Be more active each day. Walk whenever you can since every step counts. Staying active helps to keep your blood glucose levels more stable and keeps your heart strong. Staying active can surprisingly help you feel more energy and in turn, can help you manage your weight better. Take a supplement to help lower your sugar. Your healthcare provider can prescribe a medicine for your blood glucose levels if they feel it is needed to prevent diabetes. However, you can also try a supplement like Glucarex by Vita Sciences. Glucarex contains ingredients like cinnamon, chromium, and alpha lipoic acid that can naturally support weight loss, healthy metabolism, and healthy blood glucose levels.